Back in 2007, when Sturgeon Bay’s venerable Holiday Motel was being taken over by a few of us crazy musicians and re-birthed as The Holiday Music Motel, some saw its old TV antenna tower as a disposable remnant of the pre-cable era – a safety hazard that should be torn down. But the dormant structure spoke volumes to a few of us. 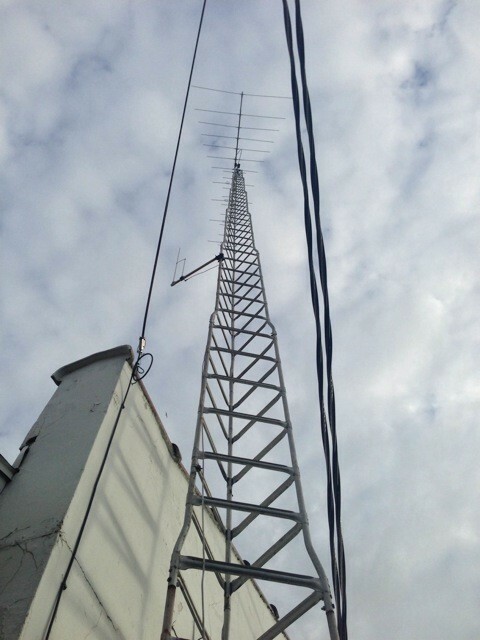 We envisioned a reversal of its role – from receiver to transmitter, TV antenna to radio broadcast tower. How better to carry our vision of musical collaboration to the deepest, furthest reaches of Sturgeon Bay and beyond? Maybe they’d hear us all the way to Valmy! But that dream would have to wait a while. We had events to organize, a motel to run, financial and even greater obstacles to overcome. The future of the bridge was still in question, fer godssake! Cut to 2012: With close to twenty big songwriting events under our belts and the same number of released CDs, plus hundreds of unreleased songs in the Holiday’s amassed catalog, the weight of our accumulated works was felt by all. And that old tower was speaking to us once again, when along came a man who would become a prime motivator behind Steel Bridge Radio. Joe Santoro, a radio visionary from the early days of FM who’d pioneered new formats successfully in the Milwaukee area, wanted to help us make some waves here in Sturgeon Bay. At Joe’s urging we decided to seek out an affordable transmitter, apply for a low power broadcasting license, and formulate an “All Steel Bridge and Holiday Music Motel Songs” radio format. We kept it quiet for the most part – local radio is a competitive business, and discretion was needed to forestall resistance – but we were excited by the prospect. All of our music would finally be heard! At last, there was a way to share all these songs with the town that inspired them! And then, at the peak of our excitement came a letdown. It was a minor glitch in the major scheme of things, but it served as a kind of reality check. Researching the availability of radio call letters (they have to be unique) we found that our first choice, WSBR (for Steel Bridge Radio) had already been taken. And our second and third choices were also unavailable. Traditional radio’s formidable downside (frequency and range limitations, control by the FCC, etc.) began to rear its ugly head. It was not the wild frontier we’d hoped it could be. Internet radio, requiring no call letters, expensive equipment, or FCC license, started looking like the more fun and affordable option. And we were considering all this when our friend James Larsen appeared at our door. This moment might have been the birth of SteelBridgeRadio.com – but internet radio was not what he came to talk about. James was working for a local station at the time. And, being a fan of all the music created at the Holiday, he wanted to play some of it on the air. The station owner was willing to offer us a weekly half hour show (basically an extended ad for the motel) in exchange for room discount coupons they could sell on their shopping show. We saw this as a great opportunity to get a lot of songs heard in a classic radio context, with James’ resonant radio voice introducing – and all without the expense and responsibility of running our own radio station! “The Holiday Music Motel Six Pack at Six” was born. We learned that James was not only an engaging radio personality, but also had production skills. His “Six Pack” – built around a different theme each week – was great radio! The only problem was its preponderance of ads (that weren’t ours). It wasn’t James’ fault – just the nature of commercial radio – but soon our objections to the number and placement of ads led to strained relations with the station. And James’ dedication to the show took time and focus from his other duties there. Suffice to say, there was a falling out. James knew what he wanted to do. Old-school commercial radio did not represent the future for him. Or for us. Internet Radio promised that wild frontier. So, in that spirit, the four of us – James, Steve Hamilton (our engineer), melaniejane, and I – began brainstorming immediately on the creation of Steel Bridge Radio. The rest of the story of how we got up and running will be told in a future segment. For now, I would like to say: We will find a use for that old tower, I swear! It’s structurally sound – built to be more than a mute mascot. And with technology soaring the way it does, who knows what monster of miniaturization may one day perch upon its pointy pinnacle? Maybe it will tell us someday. For more information about mAcdonald and his music visit purgatoryhill.com or facebook.com/patmacdonald1.